No fruit screams summer quite like the strawberry. Nemi, a quaint town in the beautiful castelli romani region 30 kilometers south of Rome, holds an annual festival in honor of these juicy refreshing heart-shaped berries. As spring arrives, not only do the trees grow greener but the market does, too. The verdant tones of peas, fava beans, artichokes and asparagus start to dominate the stalls, which are then offset by the warm splashes of vibrant stone fruit shades and one unmistakable red hue: the strawberry. These heart-shaped berries have been affiliated with love since the Roman times. According to legend, Venus, the goddess of love, wept when her lover Adonis died and it’s believed that her tears turned into strawberries upon contact with the ground. So it’s only fitting that a lively strawberry festival takes place in Nemi, a town in the Castelli Romani region south of Rome that has been frequented by Romans since the glory days of the Empire—including the Emperors themselves. Nemi is a typical charming countryside town (but let’s be honest-what Italian countryside town isn’t charming?) known for its strawberries and florals. 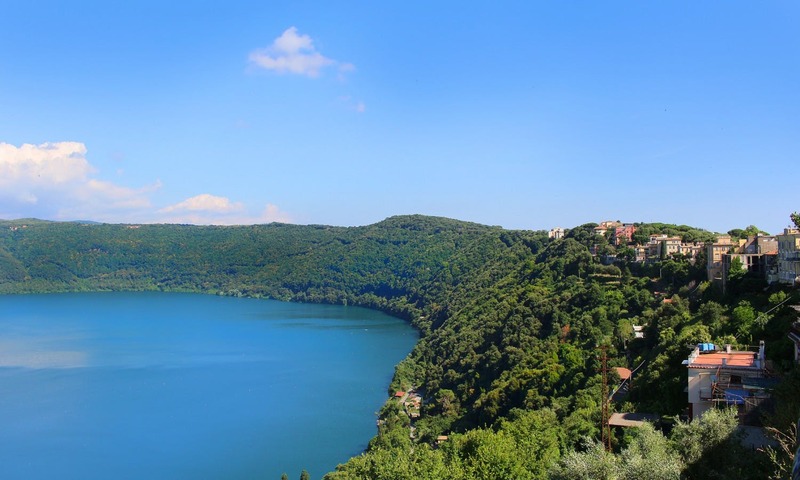 Flowered balconies, doorways and storefronts fleck the narrow lanes, and adorable shops are all perched atop a hill overlooking Lago di Nemi, a spectacular volcanic crater lake. Thanks to a perfect marriage of its special micro-climate which is protected from winds by the crater walls and ideal strawberry growing terrain, three varieties of fragoline di bosco grow in the slopes alongside the lake: two small wild berries–one round and one elongated–and the last a typical large strawberry. Locals carry out the entire harvest process completely by hand, from the planting to the maintenance to the picking. Every year since 1922, Nemi residents have dedicated the first Sunday of June to strawberry celebration. Strawberry streamers float over pedestrians who roam the picturesque streets in search of anything and everything strawberry at the various shops and cafes offering more than 1000 preparations, from pizza to pastries to granita to consume on the spot. They stock up on jams, syrups, fragolino wine, crème di fragola liquors, teas and more. 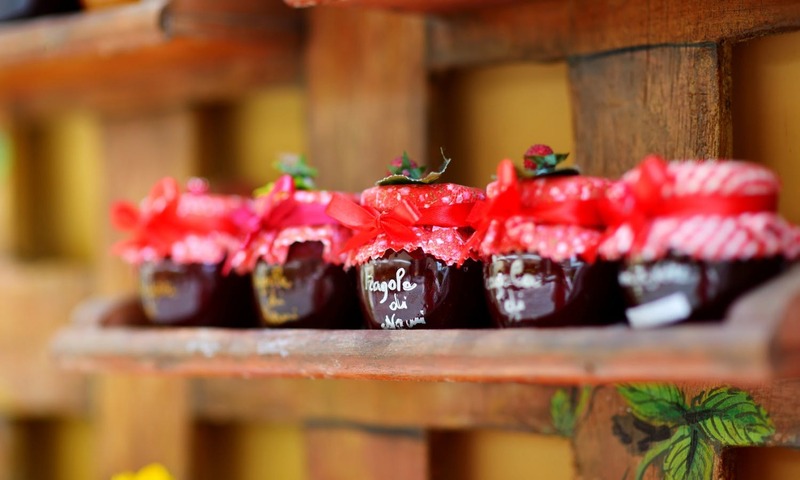 Although the fruit is primarily harvested in May, the festival kicks off in June and the week-long program includes a mass and a blessing of the fruit. Le fragolare, female strawberry gatherers dressed in traditional garb–red skirt, black bodice, white top and a mandrucella atop their heads—distribute free strawberries to passers-by. The festivities include music, dancing and good times, and carry on until the end of the month. This year’s festival—the 83rd edition—got underway on May 28th and goes until Sunday, June 5. Can’t make it this year? Don’t worry. Keep an eye on the official Visit Nemi website and perhaps you can plan a trip to Rome next year around the strawberry festivities. The problem with Rome is that visitors who go to Rome tend to stay in Rome because it’s so darn glorious. Many don’t even recognize the term Lazio—the name of the region that Rome calls home–yet are familiar with Tuscany and Umbria and tend to opt for one of these regions for a day trip when, unbeknownst to them, a sweeping hilly landscape flecked with elegant castles and glimmering volcanic lakes awaits them just a few kilometers south of the Eternal City.